The University of Prince Edward Island (UPEI) is a public university in Charlottetown, Prince Edward Island, Canada, and the sole university in the province. Founded in 1969, the enabling legislation is the University Act, R.S.P.E.I 2000. The university traces its roots back to 1804, when Lt. Governor Edmund Fanning and the Legislative Council of Prince Edward Island called for the establishment of Kent College. By 1820, the first Kent College building, known as "the National School", or James Breading's School was erected. Later succeeded by Central Academy, which received a Royal Charter in 1834. The Colleges were renamed for the Prince of Wales in honour of the future King Edward VII in 1860. The University of Prince Edward Island also traces its roots back to its two earlier predecessor organizations, St. Dunstan's University and Prince of Wales College, founded in 1855 and 1860 respectively. The two institutions were merged in 1969 by the government of Alex Campbell as part of a campaign to integrate the Island's Roman Catholic and Protestant communities, which had previously maintained the two separate institutions of higher learning. Holland College was later created to fill the void left by the merger of Prince of Wales College into the university. The University of Prince Edward Island is a non-denominational university established in 1969 by the amalgamation of Prince of Wales College (PWC) founded in 1834, and St. Dunstan's University (SDU) founded in 1855. The first student to enrol was Elizabeth Rollins Epperly, who would later become president. Its predecessor institutions ceased to operate although St. Dunstan's still retains its charter and the lands that were home to Prince of Wales became the campus for Holland College. UPEI is located on the former St. Dunstan's campus. On 8 May 2004 Canada Post issued 'University of Prince Edward Island, 1804-2004' as part of the Canadian Universities series. The stamp was based on a design by Denis L'Allier and on a photograph by Guy Lavigueur. The 49¢ stamps are perforated 13.5 and were printed by Canadian Bank Note Company, Limited. 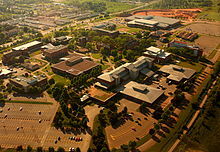 UPEI's campus, located at the corner of Belvedere and University Avenues in Charlottetown, Prince Edward Island's capital city, is built on 134 acres (54 hectares) of land. The Confederation Trail runs alongside its eastern boundary. Original SDU buildings in the central quadrangle have been renovated to retain integrity of their exterior aesthetic design while meeting modern standards. Main Building, built in 1854, and Dalton Hall, built between 1917 and 1919, are on the registry of Historic Places of Canada. The War Memorial Hall (more generally known as Memorial Hall) is a landmark building on the campus of UPEI. Built as a men’s residence building in 1946, Memorial Hall honours alumni who had enlisted and died in the First World War, and in the Second World War. Over the past three decades, UPEI has experienced significant growth with many new buildings integrated into the campus, including Central Utility Building (1973), Duffy Science Centre (1967), Blanchard Hall (1973), Bernardine Hall (1968), Robertson Library (1975), Atlantic Veterinary College (1986), Chi-Wan Young Sports Centre (1990), Wanda Wyatt Dining Hall (1990), Food Technology Centre, K.C. Irving Chemistry Centre (1997), W.A. Murphy Student Centre (2002), MacLauchlan Arena (2004), Bill and Denise Andrew Hall residence facility (2006), expansions to the Atlantic Veterinary College (2007 and 2009), Regis and Joan Duffy Research Centre (2007), a research and development laboratory which is home to the National Research Council of Canada, Agriculture and Agri-Food Canada, and other partners, and Don and Marion McDougall Hall (2008). The most recent addition is the Health Sciences Building, home to the School of Nursing and Applied Human Sciences programs. In October 2004, the UPEI administration undertook an official campus plan to improve the aesthetics of modern buildings constructed since the amalgamation which do not enhance the original SDU design, and to take overall campus aesthetics into account for future developments on and adjacent to the campus. The current President is Dr. Alaa Abd-El-Aziz, installed July 1, 2011. The current chancellor is Catherine Callbeck, who was installed on September 29, 2018. UPEI's seven faculties (arts, business, education, nursing, science, sustainable design engineering and veterinary medicine) and one school (mathematical and computational sciences) offers a wide range of programs and degrees to undergraduate, graduate and doctoral students. Co-op programs have been established in Business Administration, Computer Science, Physics, and Dietetics. Master's and Doctoral degree programs were first introduced through the Atlantic Veterinary College and, beginning in 1999, a Master of Science degree was offered through the Faculty of Science. In that same year the first students were admitted to the university's new Master of Education program. As of 2010, in addition to the MEd graduate program, the Faculty of Education offered a PhD in Educational Studies. The university also now offers a Master of Arts in Island Studies. Recently the Faculty of Business Administration began offering an Executive Master of Business Administration degree. Since 1998, The Centre for Conflict Resolution Studies has been offering courses leading to a Certificate in Conflict Resolution Studies. The Master of Applied Health Services Research (MAHSR) program is coordinated by the Atlantic Research Training Centre (ARTC). The Faculty of Education offers one-year post-degree bachelor's degrees with specializations in international, adult, and indigenous education, French immersion and human resources development, a Master of Education (MEd) in leadership in learning, and a PhD in Educational Studies. The Department of Applied Human Sciences has an accredited dietitian program. The university is accredited by a professional organization such as the Dietitians of Canada and the university's graduates may subsequently become registered dieticians. The Faculty Development Office provides professional development courses applicable to many sectors and industries, including development programs for administrative assistants and new managers; collaboration, conflict, and communication training; and, financial management courses. In Maclean's 2019 Guide to Canadian Universities, UPEI was ranked in 9th in the publication's category for "primarily undergraduate" Canadian universities. UPEI manages over $17 million in annual research expenditures. The on-campus biosciences and health research facility is used by researchers from UPEI, National Research Council (Canada), and Agriculture and Agri-Foods Canada. UPEI houses the L.M. Montgomery Institute, founded in 1993, which promotes scholarly inquiry into the life, works, culture, and influence of the Canadian writer, L.M. Montgomery. The collection of novels, manuscripts, texts, letters, photographs, sound recordings and artifacts and other Montgomery ephemera. The UPEI Panthers have nine teams playing in the Atlantic University Sport (AUS) and the Canadian Interuniversity Sport (CIS), including men's and women's ice hockey, soccer, basketball, as well as women's field hockey and rugby union and co-ed swimming. The UPEI campus provides its students with many athletics amenities typically found on university campuses. The CARI Complex is a public recreation facility located on the campus and includes two hockey rinks (the MacLauchlan Arena as well as a practice rink) as well as two 25-metre swimming pools (a shallow recreational wading pool, and an eight-lane competitive pool with diving boards). In 2009 UPEI inaugurated the UPEI Alumni Canada Games Place which was built in part to host the 2009 Canada Games. It consists of a "class 2" eight-lane 400-metre running track and rugby field that has spectator seating for 1,335. UPEI accommodates 434 students in three residences, Bill and Denise Andrew Hall, Blanchard Hall, and Bernardine Hall. Bill and Denise Andrew Hall has two-room suites with single bedrooms. In Blanchard Hall, each suite has two single bedrooms with a kitchenette and a living room. Bernardine Hall (known as "Bernie" to the students) offers suites with two double bedrooms and a shared bathroom. Although the hall is co-ed, one floor is female-only. In 2015 each of the first 5 presidents were recognized as Founders of the University. Being a long-standing university and college in the Maritime province of Prince Edward Island (called the Cradle of Confederation) UPEI/SDU/PWC have been in a position to provide education to a long list of people who have gone to notable achievements. The most well known graduate (of Prince of Wales College) is Lucy Maude Montgomery, author of "Anne of Green Gables" and other books. The most distinguished Saint Dunstan's graduate may be James Charles McGuigan, Cardinal-Priest of Santa Maria del Popolo in Rome. James Charles McGuigan - Cardinal; Archbishop of Toronto; Cardinal-Priest of Santa Maria del Popolo in Rome. James Morrison (bishop) - Archbishop, Bishop of Antigonish, NS; studied at the Urban College of the Congregatio de Propaganda Fide in Rome. Heather G. Morrison - Rhodes Scholar, Oxford University, Medical Doctor, Chief Public Health Officer of PEI. Sir Andrew Macphail - Physician; Writer for Chicago Times; Enlisted in Canadian Army in WW I at age 50 as ambulance driver. Knighted in 1918 for literary and military work. Sir William Wilfred Sullivan - 4th Premier of PEI; Knighted by King George V.
Herbert James Palmer - 11th Premier of PEI; son of former colonial Premier Edward Palmer (Canadian politician). James Lee - 26th Premier of PEI; Sworn to Privy Council of Canada by Her Majesty Queen Elizabeth II. Walter Russell Shaw - 22nd Premier of PEI; Officer of the Order of Canada; Canadian Agricultural Hall of Fame in 1980. Cynthia Dunsford - MLA, Squash Coach, Writer/Performer of CBC Radio comedy show "Parkdale Doris." Paul Connolly - Educator, Politician; Member National Parole Board in 2002, serving for seven years. Doug Currie - MLA; Head Coach and Director of Hockey Operations for the University of Prince Edward Island. Alexander Campbell (Newfoundland politician) - represented St. John's in the Newfoundland and Labrador House of Assembly, 1928–32; also grad Royal College of Physicians of Edinburgh and the University of Vienna. Tyler Shaw - Singer; 2012 Billboard Canada Adult Contemporary # 5 song "Kiss Goodnight." Song was certified Gold by Music Canada in 2013. Scott MacEachern - Professor of Archaeology and Anthropology at Duke Kunshan University, China, an expert in African archaeology. Sir James Hyndman - Alberta Supreme Court Judge; Inducted as a Commander of the Order of the British Empire in 1948. J. Greg Peters - Superintendent of the Royal Canadian Mounted Police and Usher of the Black Rod of the Senate of Canada. Ian MacDonald (politician) - 43rd Mayor of Charlottetown; Known as "Tex"
Ralph McInerney - World War I Pilot in Royal Flying Corps; Represented the city of Saint John, New Brunswick in the Legislative Assembly of New Brunswick from 1939 to 1948. Park Ye-eun (ice hockey) - Korean Women's Ice Hockey Team, 2018 Olympics in Pyeongchang, Korea. Katie Baker - Captain Canada National Field Hockey Team; Pan American Games 2007 in Brazil; Commonwealth Games 2010 in Delhi, India. Cory Vitarelli - Lacrosse player for Rochester Knighthawks in National Lacrosse League. Three time Champion's Cup now known as (National Lacrosse League Cup) winner. Art Linkletter - Canadian-born American radio & television personality, "Kids Say the Darndest Things"
Angus Bernard MacEachern - Founded St. Andrew's College; 1st Bishop of Charlottetown (incl Magdalen Islands); studied theology in Spain. David Bourque - Associate Professor of Music (Spring 2008 term); teacher of clarinet and bass clarinet; member of Toronto Symphony Orchestra; accompanist in several US films, e.g., Academy Award-winning Norman Jewison's film "Moonstruck"
Ian Dowbiggin - Professor in the Department of History and writer on the history of medicine. Fellow of the Royal Society of Canada. Paul Boutilier - Instructor of International Marketing; Retired professional ice hockey defenceman who was a member of the 1983 Stanley Cup champion New York Islanders. Marcia Anastasia Christoforides - Established the Sir James Dunn (James Hamet Dunn) Animal Welfare Centre at UPEI with gift of 2.2 million dollars. Wife of Max Aitken, 1st Baron Beaverbrook with honorific as Dowager Lady Beaverbrook. ^ "Full-time plus Part-time Enrollment" (PDF). Association of Atlantic Universities. 2016-10-01. Retrieved 2017-01-20. ^ "University Act, R.S.P.E.I 2000" (PDF). Province of Prince Edward Island. Archived from the original (PDF) on September 10, 2014. ^ a b "University of Prince Edward Island, 1804-2004". postagestampguide.com. Retrieved March 21, 2019. ^ a b "University of Prince Edward Island". The Canadian Encyclopedia. ^ "UPEI honours Dr. Elizabeth 'Betsy' Epperly through plaza dedication". University of Prince Edward Island. Retrieved 20 September 2016. ^ "Main Building - University of Prince Edward Island". Canada's Historic Places. Parks Canada. Retrieved March 21, 2019. ^ "Dalton Hall - University of Prince Edward Island". Canada's Historic Places. Parks Canada. Retrieved March 21, 2019. ^ "Memorial Hall". University of Prince Edward Island. Retrieved March 21, 2019. ^ a b "UPEI". Archived from the original on 2014-08-26. Retrieved 2014-08-21. ^ "Chancellor". University of Prince Edward Island. Retrieved March 21, 2019. ^ "Faculty Development Office". University of Prince Edward Island. Retrieved March 21, 2019. ^ a b "University Rankings 2019: Canada's top Primarily Undergraduate schools". Maclean's. Rogers Media. 11 October 2018. Retrieved 13 October 2018. ^ "Canada's Top School by Reputation 2019". Maclean's. Rogers Media. 11 October 2018. Retrieved 13 October 2018. ^ "Research - About Us". University of Prince Edward Island. Retrieved March 21, 2019. ^ "Welcome to the L. M. Montgomery Institute". University of PEI. Retrieved March 21, 2019. ^ "Aquatics Facility Description". Capital Area Recreation Inc. Archived from the original on 25 June 2009. Retrieved 2009-12-28. ^ "Hosting History" (PDF). Capital Area Recreation Inc. Archived from the original (PDF) on 24 October 2009. Retrieved 2009-12-28. ^ "UPEI Alumni Canada Games Place". University of Prince Edward Island. Archived from the original on 20 August 2009. Retrieved 2009-12-28. ^ "Bill and Denise Andrew Hall". University of PEI - Residence Services. Retrieved March 21, 2019. ^ "Blanchard Hall". University of PEI - Residence Services. Retrieved March 21, 2019. ^ "Bernardine Hall". University of PEI - Residence Services. Retrieved March 21, 2019. ^ Phillips, Nicole. "UPEI honours all past-presidents as Founders of the University". University of Prince Edward Island. Marketing and Communications. ^ "Morrison, Dr. Heather G." Government of Prince Edward Island. Retrieved March 21, 2019. ^ "Past Honorary Degree Recipients". University of PEI. Retrieved March 21, 2019. Bruce, Marian. A Century of Excellence: Prince of Wales College, 1860-1969. Charlottetown: Prince of Wales Alumni Association/Island Studies Press, 2005. Bruce, Marian. Pets, Professors, and Politicians: The Founding and Early Years of the Atlantic Veterinary College. Charlottetown: Atlantic Veterinary College/Island Studies Press, 2004. MacEachern, Alan. Utopian U: The Founding of the University of Prince Edward Island, 1968-1970. Charlottetown: University of Prince Edward Island, 2005. Moase, Lorne Robert. "The Development of the University of Prince Edward Island, 1964-1972." M.Ed., University of New Brunswick, 1972. Wikimedia Commons has media related to University of Prince Edward Island. This page was last edited on 17 April 2019, at 15:01 (UTC).